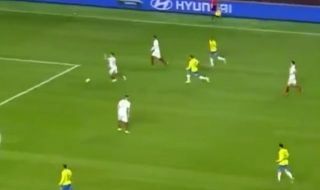 Roberto Firmino dragged Brazil level against Czech Republic on Tuesday night as he was alert enough to pounce on a defensive mistake. The Selecao had fallen behind in their international friendly, with David Pavelka giving the hosts the lead in the first half. However, just four minutes into the second period Firmino pounced to find an equaliser, as seen in the video below. The Liverpool forward was alert and showed great pace to get to the ball first before keeping his composure to slot the ball past the goalkeeper and into the back of the net. Albeit not the flashiest of goals that he’ll ever score, Firmino will undoubtedly be delighted with it nonetheless, as it showed all his strengths. From closing the defender down to being switched on to anticipate the stray pass and produce the end product, it was an important goal for his side as they searched for a way back into the encounter.
? – There's something that the Kop wants you to know…@LFC's Roberto Firmino has drawn Brazil level in tonight's international friendly! ?